Going nowhere fast, a photo by The Bacher Family on Flickr. 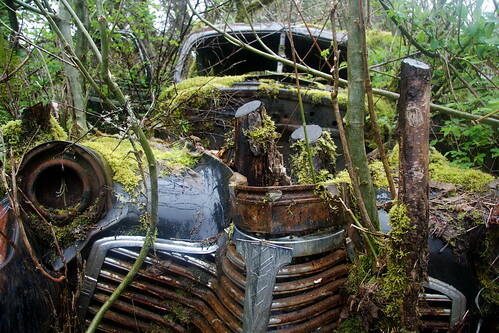 North of Corvallis, Oregon, along the side of a rural road, you'll find this old car, abandoned years ago. In fact, you could estimate how long ago by counting the rings in the trees growing up through the engine compartment. My father and I stumbled across this old beast while geocaching (there was a cache hidden somewhere on the car), and after retrieving the cache, I spent a few minutes looking for the best angle from which to photograph the car. It was pouring down rain, so I'm pleased that the picture I managed to get turned out so well.